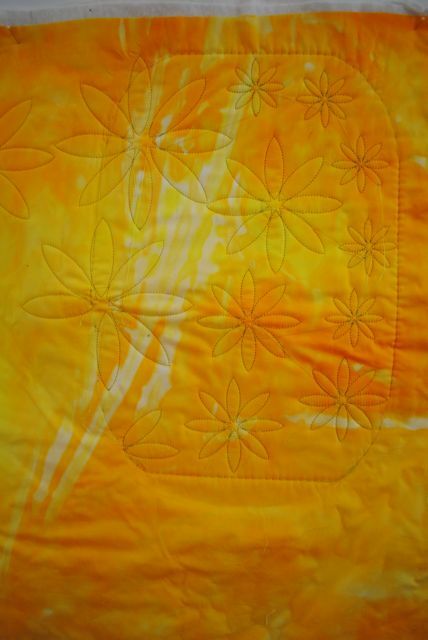 Explorations in Quilting and Life: Learning the Bernina! Well, I spent many hours last week and the week before learning how to quilt on my embroidery module. The outcome was progress and a lot of positive feelings about the potential of the tool. Unfortunately, it will take time for me to learn how to use the module well enough to actually use it in a project I would like to turn out well. Fortunately, I realized that before I tried it on my current India art quilt! I have had to let go of more progress on the Bernina for the moment, due to some upcoming travel and deadlines for shows, etc. But, I can share what I did accomplish. Here is a photo of the quilting on a 'draft'. It is a partial of the entire quilt pattern that I designed. To have done that would have required changing hoops three times and I was having problems with interpreting the necessary registration marks for that process. As was pointed out to me quite lovingly, I began with an advanced project - not at all surprising for me. As you can see, the larger flowers on the edge of the hoop basting don't match up quite right. In any event, I am looking forward to playing more with the tool. I suspect my next project will be a design that fits in one hoop for a start. Then one that requires only one hoop shift! And, perhaps by then, I will have figure out the nuances of a PC computer and the various options in the embriodery module on my machine. Given all I have to learn, this wasn't too bad! I rather like the random placement of the flowers, Judy -- even if it wasn't intended! When you can see the whole thing, Margaret, it is actually a flow of large flower shapes from top left to lower right, surrounded by other smaller shapes. Someday I will be proficient enough to use it in a quilt!